To this day I deeply regret that I did not have a camera with me the first time I visited Melin Hywel (or Melin Howell) with my rather lovely friend. I remember the mill was unlocked and so we wandered about the interior seeking to imagine the pounding, grinding and hissing noise in an atmosphere of corn flour dust. 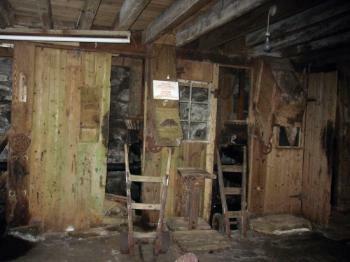 It was around 2000, I think and even then the timbers were showing the sign of ageing and woodworm. 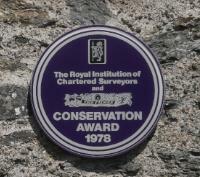 At that time, this Award Winning Conservation Project still retained the signs of respectful and caring artifice. Bear with me on that last quote. It will all make sense in the end. Sadly. For now just contemplate the elegant marriage of industrial heritage and natural Anglesey rural beauty. 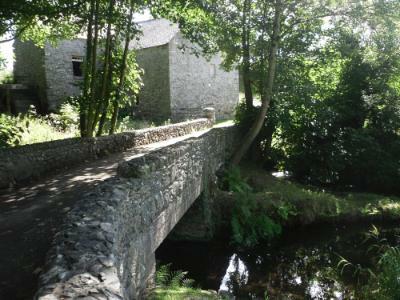 It is recorded that there was a watermill here in the Llanddeusant area since at least 1335 and in one guise or other it remained in operation probably until the late 1970s to early 1980s. A few miles away you will find Llynnon Mill which is still operational grinding out the flour that I use to make some pretty lovely bread. An interesting fact about Anglesey windmills, by the way, is that during the nineteenth century the Island had 49 of the recorded 92 Welsh corn windmills. Flat and pretty windy, I hear you say. Like many Anglesey people my Mum knows Melin Hywel as Melin Selar, which is the local name it takes from the farm on whose land it sits on, Seler. The watermill has been restored twice recently in 1975 and 1985 and is due for a further renovation, as I will reveal further down. 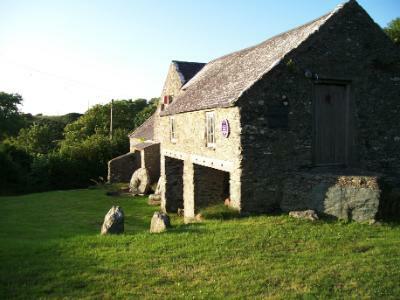 The building you see today is with the 1850 extension to the earlier 18th Century watermill, which originally was sited in the Commote of Chwaen. To find out what a COMMOTE is may I respectfully guide you to my page on the Church of Llanfair yn y Cwmwd for an explanation. There is only one working miller on Anglesey these days, and you will find him and his capable assistant at Llynnon Mill a few miles away. 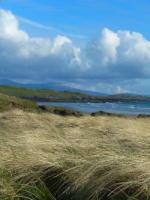 Anglesey County Council at its very best. I believe that it was the Rowlands Family who worked Melin Hywel Watermill, as they had others on Anglesey for a very long time. Some people on Anglesey will have enormous affection for the quietly intellectual and gentlemanly Reverend John Rice Rowlands who is of the same family. As, I believe, was the mother of Mr Jack Mowbray of Glanrafon, who was a ‘Rowlands’ before she married into the Mowbray family. They kept a shop in that small hamlet in Anglesey’s heart. Those who remember Mr Jack Mowbray’s shop may also remember stories about Siop Uchaf (‘Upper Shop’) - now called Crud yr Awel - also in Glanrafon. That shop was kept by the family of the now departed Johnny Madoc Jones, former Classics teacher at Llangefni Grammar School and then Secondary School. Ysgol Gyfun, ynde. Back to specific Melin Hywel history, although I cannot confirm it categorically I believe that part of the current structure reaches back to the earlier centuries of the watermill’s operational life. I refer you to an engineering report by W J Crompton, RCAHMW, (11 June 2008). 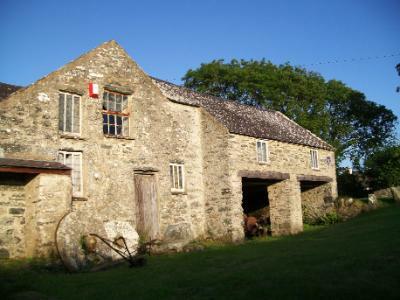 Melin Hywel … was extended in 1850, with a kiln to the north and a granary and cartshed on the south, the upper storey of the latter accessed from the side of the millpond at the south end. Inside, a two-stage gear train drives a horizontal layshaft which in turn drives three pairs of stones and a number of ancillary machines through belts and a vertical shaft. 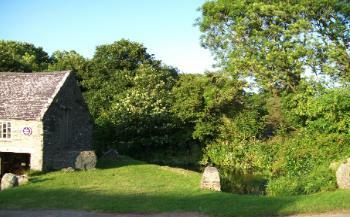 A mill was recorded on this site in 1352. 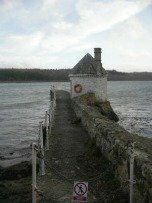 In the 1970s this was the only working mill in Anglesey, with a thriving business in animal feed, which ceased only a few years ago. 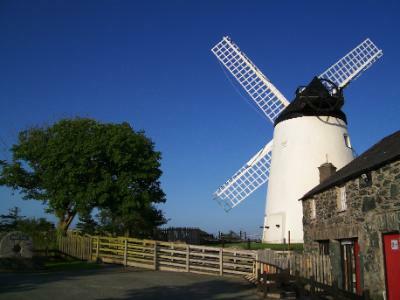 Durng the 1970s Melin Hywel and Melin Llynnon Windmill were one of the only two pairs of working wind and water mills in one rural location in Britain. 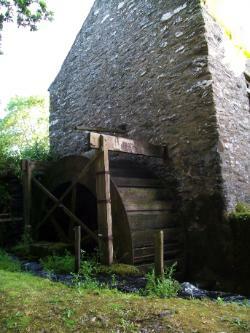 The Mill Race which once provided the power to turn the overshot wheel was supplied by Afon Alaw (River Alaw). 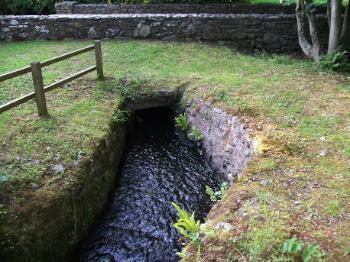 The water was originally constrained from its natural flow by a dam near Capel Elim. The flow over the manufactured dam would allow for a regular and controlled flow to turn the waterwheel at a speed that assured safe operation. 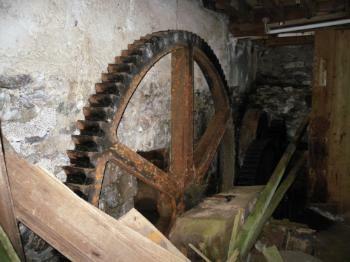 Rather like my Llynnon Mill page where I mention that the windmill cannot function in very high winds. There was always a danger of the machinery tearing itself asunder. 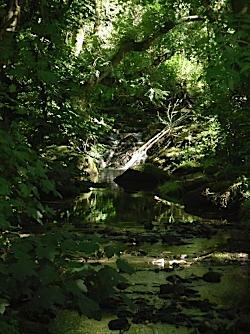 It is still the Afon Alaw that gathers in mill pool though now its flow is directed past the waterwheel. The river flows in its natural setting down below the mill and offers beautiful and lush images to pump up your aching Soul for quite a while. What can I tell? John Wesley was correct when he quoted from Matthew 6:19-21 about laying out our wares to be corrupted the physics of Entropy. Nonetheless, Melin Hywel Watermill still attracts our attention and draws in our imagination to manufacture bygone days of loud and productive rural industry. As usual, romanticism generally precludes a consideration of the appalling poverty that prevailed in the heart of Anglesey. You can glance in through the broken windows to gain an appreciation of the machinery, large cogs and corn flour chutes. You can gather a pretty good understanding of its workings if you take the time to visit Melin Llynnon Windmill and view its magnificent mechanical interior when the sails are at full tilt. I suppose that one possible explanation for the damage could be the fact that the farmer at the adjacent Seler Farm had declared that he did not want the watermill to become a full-on tourist site. Unlike the thriving windmill a few miles to its west, its isolation has worked against it as it became to be an easy target for some inappropriate and uncivil attention by some slimy and ignorant scum-like, illegitimate persons. I Love this rural idyll and I hope you do. 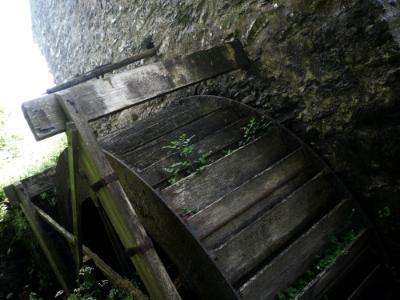 Return from Melin Hywel Watermill to HOME PAGE.